Descendants of Vietnam veterans and refugees confront the aftermath of war and, in verse and prose, deliver another kind of war story. 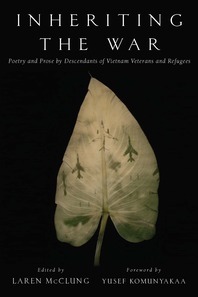 Fifty years after the Vietnam War, this anthology by descendants of Vietnam veterans and refugees—American, Vietnamese, Vietnamese Diaspora, Hmong, Australian, and others—confronts war and its aftermath. What emerges is an affecting portrait of the effects of war and family—an intercultural, generational dialogue on silence, memory, landscape, imagination, Agent Orange, displacement, postwar trauma, and the severe realities that are carried home. Including such acclaimed voices as Viet Thanh Nguyen, Karen Russell, Terrance Hayes, Suzan-Lori Parks, Nick Flynn, and Ocean Vuong, Inheriting the War enriches the discourse of the Vietnam War and provides a collective conversation that attempts to transcend the recursion of history.